CR4 grade cold reduced mild steel in various thicknesses. Electrically welded side seam, with ends double seamed and solutioned. Galvanised ring with either internal or external quick release lever, two prong latch fastener or screw closure with nut and bolt. Wire drop or bale handle with grip. Interior Plain, varnished or lacquered. A keg is a small open top drum that is a suitable container for transporting powders, pastes and semi-solids such as dye stuffs. We manufacture kegs with eight different diameters and a wide range of heights. 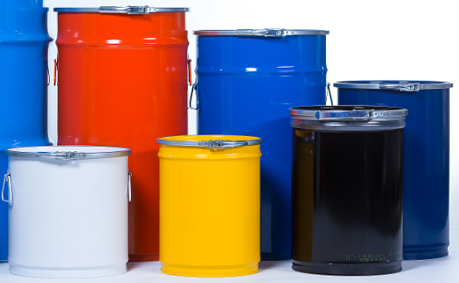 These are all made to British Stands with most meeting the requirements for UN Group I or II for solids, whilst some of our 305mm (12”) and 356mm (14”) diameter kegs are certified for the packaging of UN Group II liquids. The lids are completely removable and can be supplied with or without sealing washers. A variety of different closing rings can be used to secure the lids in place depending on which is the best fit for the customer and their processes.